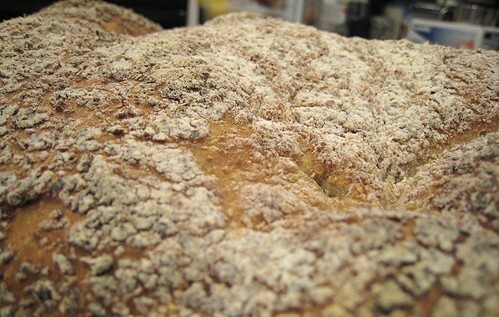 It seems that everybody and their grandmother has tried this no-knead bread. Why should we be any different? We decided to make two versions: a whole-wheat and a white. Rummaging around the house, we found only this packet of yeast. 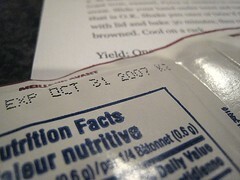 Yes, expiry date: October 2007. But then we thought, the yeast wouldn't die when they're in hibernation in the first place, right? I'm sure these little hibernating yeasties are still fine, right? With a brave front, I marched ahead. 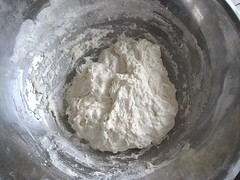 So, I mixed the flour, salt, yeast and water as directed. Here are the shaggy masses. They were supposed to rest for 12 to 18 hours. However, nobody could be there to take care of them at that time. So ours rested for 24 hours. I figured it shouldn't hurt the process. They looked like they were "dotted with bubbles", more or less. 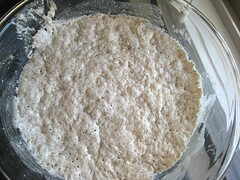 So the yeast worked! 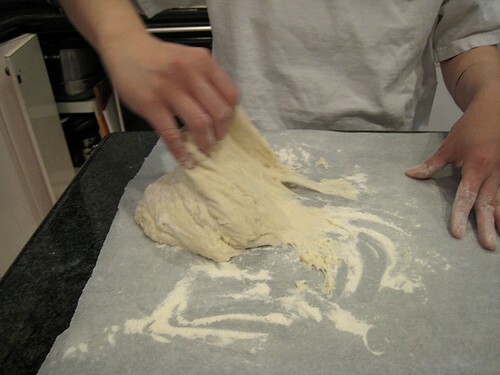 This is me "shaping" the doughs. They weren't the most attractive things in the world, but what can you do? They're still so "shaggy"! 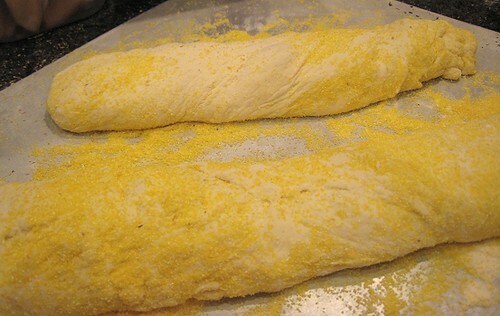 More resting for them, then onto the wheat bran- and cornmeal-coated cloths. The instruction said to put the seam side down. 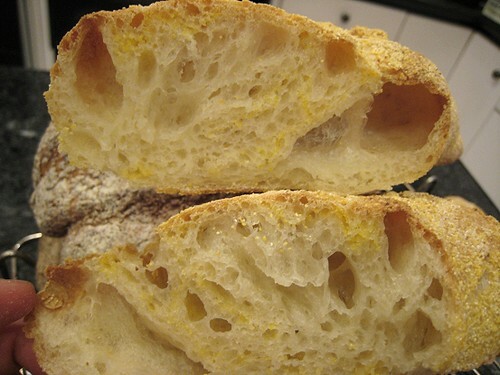 Actually, our doughs were so soft that I couldn't even really lift them in their "shaped" form, let alone trying to aim the "seam side" onto the cloth. 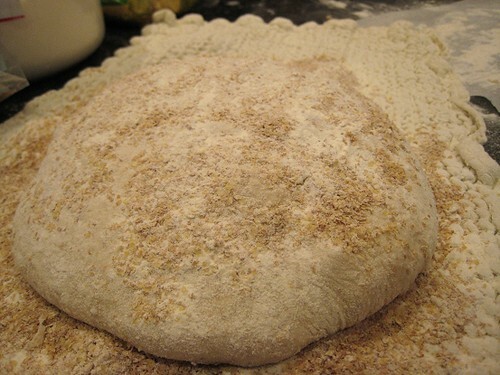 Wheat bran and flour for the whole-wheat bread. 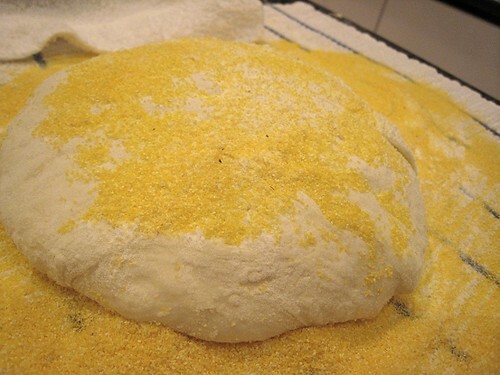 Cornmeal for the white bread. Some logistics complications next. We only have one enamel-coated cast iron pot and nothing else that is oven safe at that temperature (45o degrees). While the pot was heating in the oven, we had to think of something fast. I thought that perhaps I can just use a baking pan and cover it somehow. 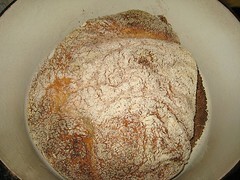 Although, that was a bit tricky since I was assuming the bread would rise above the rim of our baking pans. 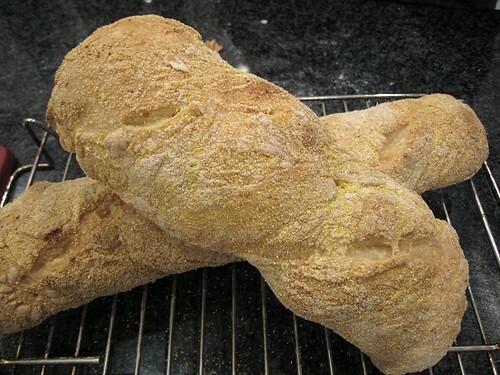 JS threw out the idea of making baguette shapes. Hmm. I was resistant at first, but finally, why not? 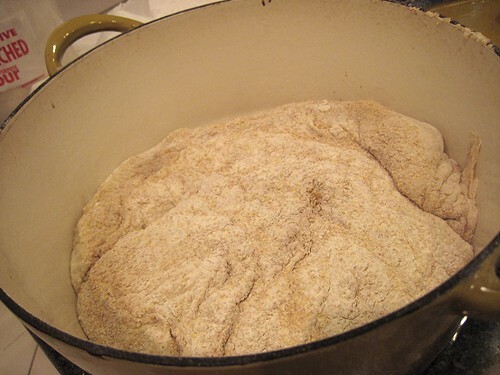 Into the hot pot the whole-wheat bread went -- again, there was no way I could "slide [my] hand under the towel and turn the dough over into pot, seam side up." The dough could barely contain itself. 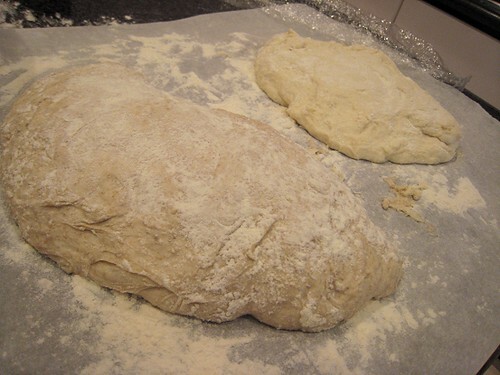 The white dough didn't have much body either. These are the sorriest "baguette" shapes I have ever seen. 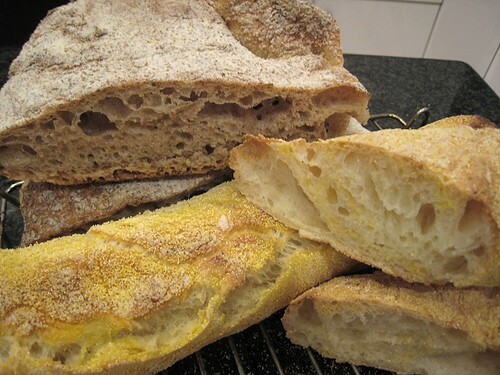 They're barely detectable, but I tried "scoring" these "baguettes". The cuts closed up fast. The only marks I left were the "skin" of the dough becoming all wrinkly and saggy like that. After a bit of waiting, out they came. The "baguettes" weren't as ugly as they promised to be. In fact, they kind of have a stubby charm all their own. When you cut them, you can barely tell that they had knarly misshapen selves. 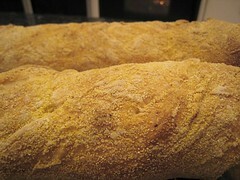 These "white" bread loaves have cornmeal within them because I had the dough shaped as a ball first when it was enclosed in that cornmeal cloth. I only "shaped" them into baguettes afterwards. It looks nice all marbled like that. 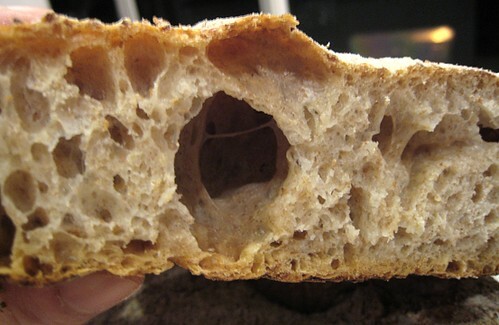 The whole-wheat bread looked more "normal". When all is said and done, they didn't turn out too shabby, eh? This was fairly easy to do. 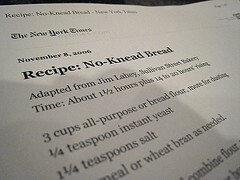 No-knead didn't necessarily mean no-work, though. 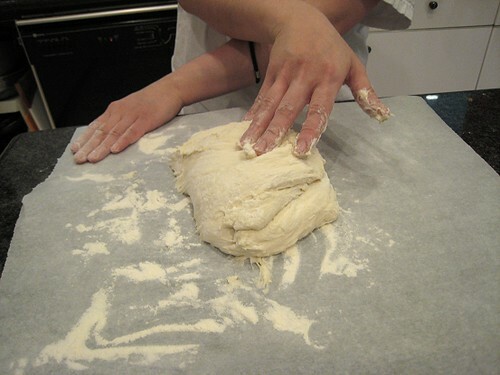 And sometimes, it's fun to knead! 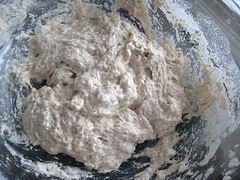 It's rewarding to see a lump of shaggy mass turn into an elastic smooth dough. 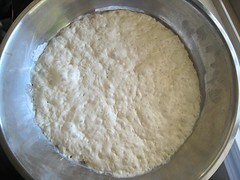 That's what I missed about the whole experience: the pretty, elastic, smooth round dough. I watched a similar recipe some time ago in Good Eats but completely forgot about it until I read your entry last week. I tried to make it yesterday and can't believe how easy (but messy) it was! Pictures here and here. Although there was something funny with the end result (the bottom was too crusty), I will certainly try to make it again. Thanks!